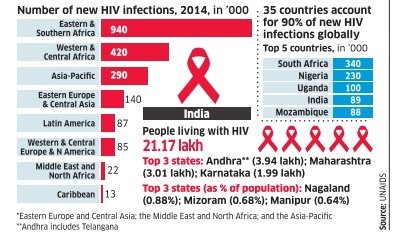 Home > World Days - December > About 42% decline in AIDS-related deaths since the 2004 peak..! About 42% decline in AIDS-related deaths since the 2004 peak..! Countries should front-load investments to ensure the global AIDS epidemic stops being a public health threat by 2030, says the UN. Rapid treatment scale-up has led to a 42% decline in AIDS-related deaths since the 2004 peak. However, new HIV infections declined globally by just 8% during 2010-14 & some regions.